We currently have a stall at our gate where we can sell chicken eggs. 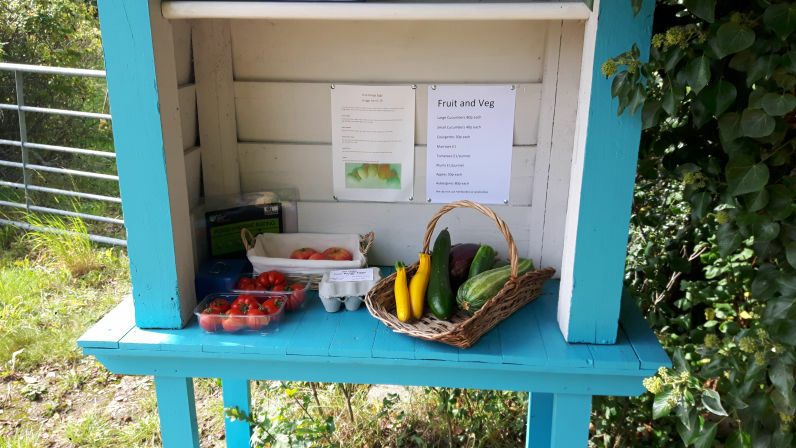 We are hoping to have jams and chutneys for sale in the near future. We also sell meat (straight from the butchers) by prior arrangement. In the autumn we may have some mutton (a sheep over 2 years of age) for sale. Hogget will next be available summer 2020. Hogget and mutton are both sold by the half sheep and can be cut to your specifications. We can do distance sales on meat. We will post on the website and facebook page when will next have hogget and mutton available. At Six Oaks we like to use as much of the animal as we can. When our sheep make that final journey we also collect the skins and horns. After the appropriate processing we are proud to be able to offer them for sale. These are, like the meat, a limited product but we have some in stock and they can be pre-ordered. Please contact us if you are interested in hogget, mutton, sheepskins or horns. 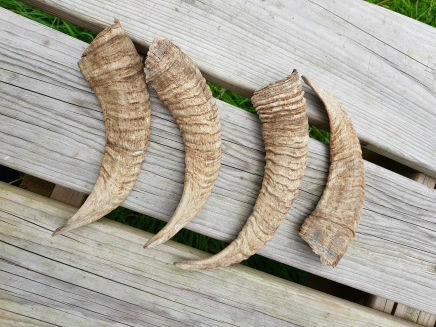 We have four ewe horns available for sale. They have been cored but are otherwise unprocessed. £5 per horn (+ p&p). Please get in contact if you are interested in buying or pre-ordering. We are very proud of our organically tanned sheepskins. The wool is soft and thick under your hand whilst the skin is beautifully smooth. Sizes do vary slightly but they are around 70cm wide and 100cm long. £95 per sheepskin (+ p&p). Please get in contact if you are interested in buying or pre-ordering one.